Update: Latest Axon 7 B10 Nougat stock firmware and the upcoming Oreo firmware is now available for downloads. ZTE Axon 7 is now receiving yet another OTA update for Android 7.1.1 Nougat with firmware build number A2017GV1.0.0B11. Following, you will also find the the full stock firmware based on MiFavor 4.0+ as well as the factory images. 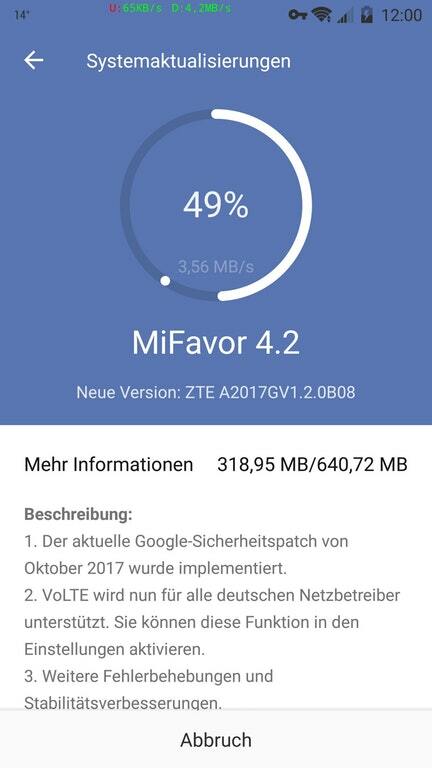 ZTE also released an Android 8.0 Oreo build for Axon 7 based on MiFavor 5.2. Download and install OTA updates, MiFavor stock firmware files, and factory images for ZTE Axon 7. Axon 7 is ZTE’s elite smartphone which gained a lot of popularity after the launch. It is a budget phone with top-notch hardware specification but not so much on the software though. Axon 7 was launched with 6.0.1 Marshmallow and later received Android 7.1.1 Nougat. Though the smartphone got the latest firmware update, it is not very stable. It still has a few bugs and need minor touch-ups here and there. This makes the next Axon 7 B08 OTA update a must have software upgrade from every user. ZTE is doing its best to release OTA updates from time to time. The firmware being close to stock AOSP, it has performance. Axon 7’s new OTA update brings a new firmware build number A2017GV1.2.0B08 based on Android 7.1.1 Nougat. The B08 update also features the latest October 2017 security patch. It also features VOLTE support in many countries. The rest can be transcribed from the image below. While ZTE is looking forward to rolling out Android 8.0 Oreo Beta update, an exact date is not know. Following OnePlus’s Open Beta for Oxygen OS Oreo, and the recent Samsung Galaxy S8 Oreo beta, all other manufacturers are rolling out the Android 8.0 OS for their respective Android phones. Read: How to root Android 7.1.1 Nougat? Update: Axon 7 MiFavor 5.2 based on Android 8.0 Oreo full stock firmware is also available. We have managed to capture the OTA update for Axon 7’s latest B08 software version. As it is an OTA zip file, make sure your Axon 7 is running the previous B05 firmware. Following are all the necessary OTA updates, full stock firmware updates, factory images, and recovery files for ZTE Axon 7. How to install Axon 7 stock Android 7.1.1 Nougat update B10? This is by far the safest methods. Once downloaded transfer it to phone storage or SD card as update.zip. If downloaded on your phone then rename it to update.zip. Make sure it is in root directory of your SD card and not in any folder. Go to Settings > System Update and check for updates. It should show the udpate file. Once found, tap on the update and install it. Once it’s rebooted, got to Settings > System Update again and check for B08 OTA. Rename the file to update.up or fota_B08_B12_ssl.up or A2017GV1.2.0B08.zip. Now reboot into stock recovery. To do so, turn off phone, press and hold volume down and power keys at the same time. From the recovery, choose the option, update from SD card or storage. Select the update package from the destination. The best way is to install the OTA using ADB sideload method. Or see this tutorial here. Make sure your device has USB debugging enabled. Setup ADB and Fastboot on PC. Reboot phone into stock recovery. Select install using ADB sideload method. Open terminal or command prompt on PC. Press enter and reboot to system when done. Follow us on social media. Comment down below for queries.